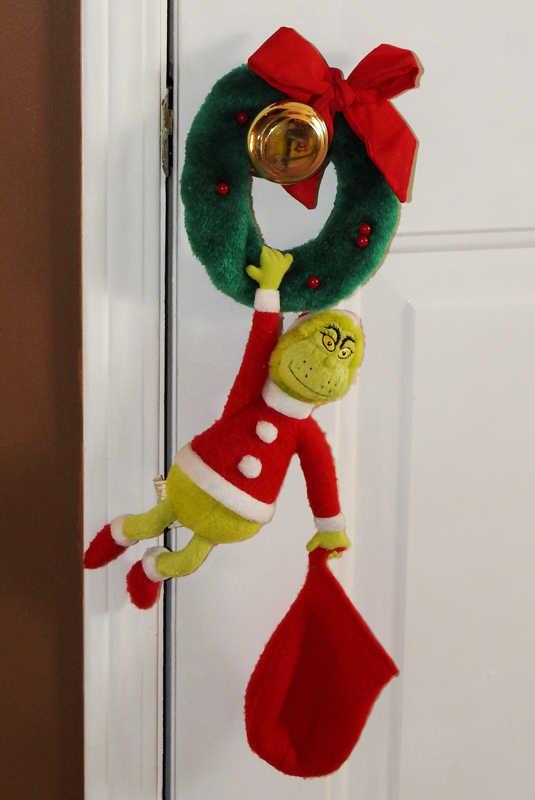 At Home with Gracey: What Makes a Grinch Smile? What Makes a Grinch Smile? In our house, even the grinchiest, bah humbug, visitor will crack a smile when this little guy pipes up and sends out his Christmas Greeting. 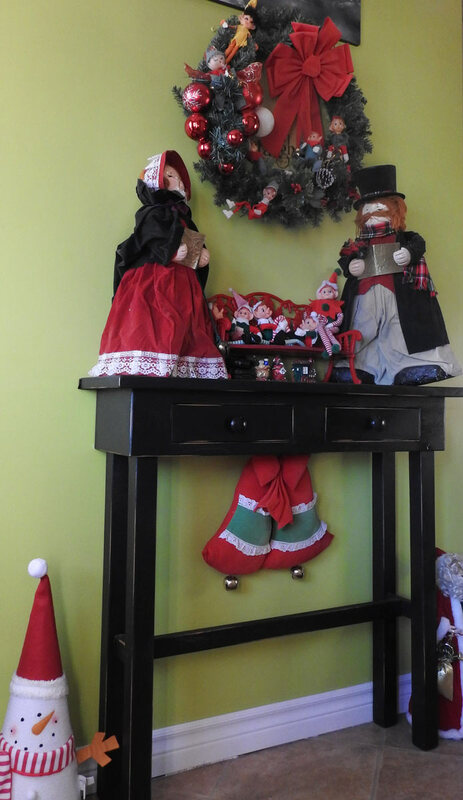 I got this cutie 3 or 4 years ago at a liquidation outlet, and since then, every year at Christmas he sits on the front staircase to greet our visitors. Even after all this time, he still makes me laugh. By the time he's done his song, most people are laughing, or grinning ear to ear. When I feel a little miserable, I'll turn him on and be smiling by the end. 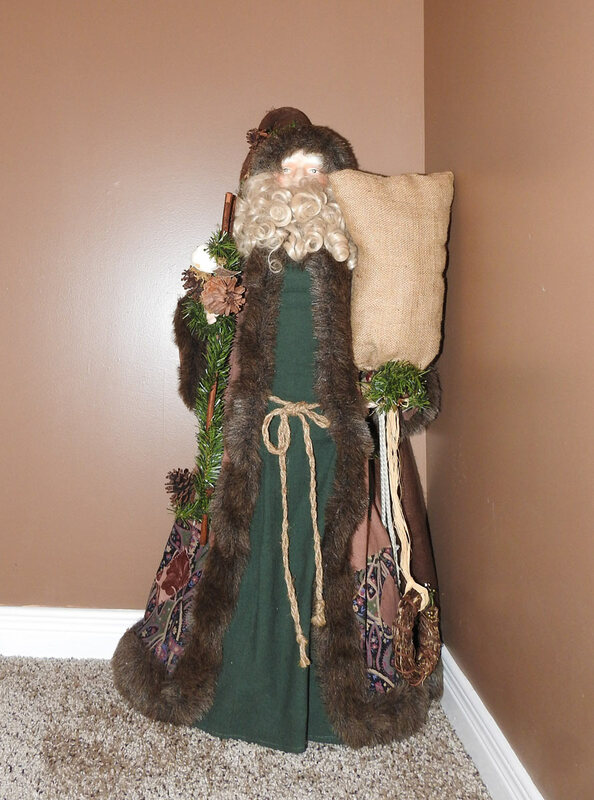 Probably one of my favourite holiday decorations. When I first got him, I thought my daughter's two Boston Terriers would get a kick out of him ... they loved stuffed things, but you have to watch them because they can destroy one in under a minute. I didn't want them to wreck it, but ... well, the first time we played it the dogs were terrified ... hahaha. 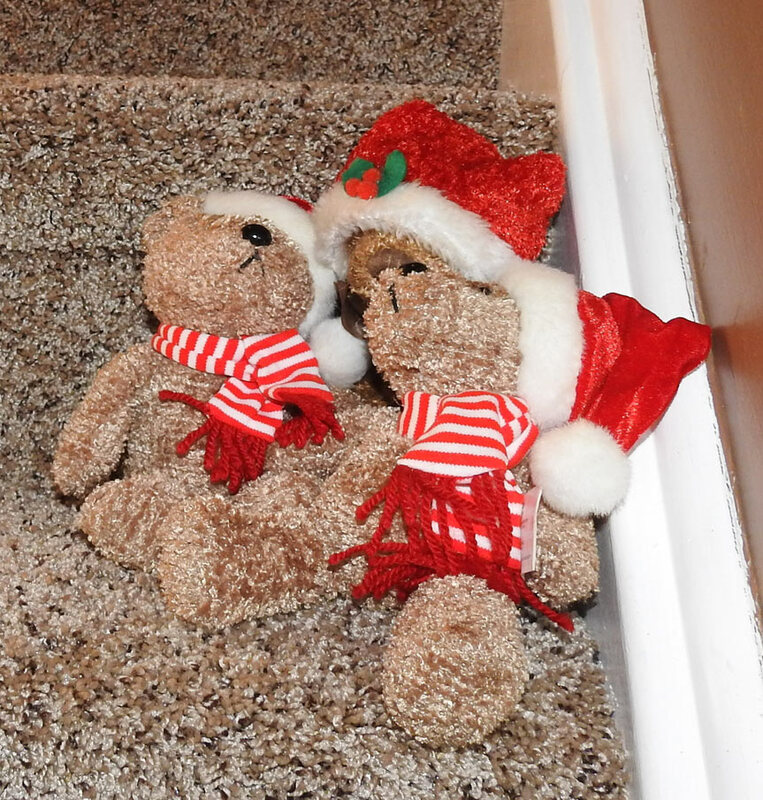 It didn't take them long to realize that Santa Dog wasn't coming after them, and once they warmed up to the idea that it was just a toy, well, I had to move him out of reach. Toys = chewing to those two girls, and chewing ends up with a destroyed toy. 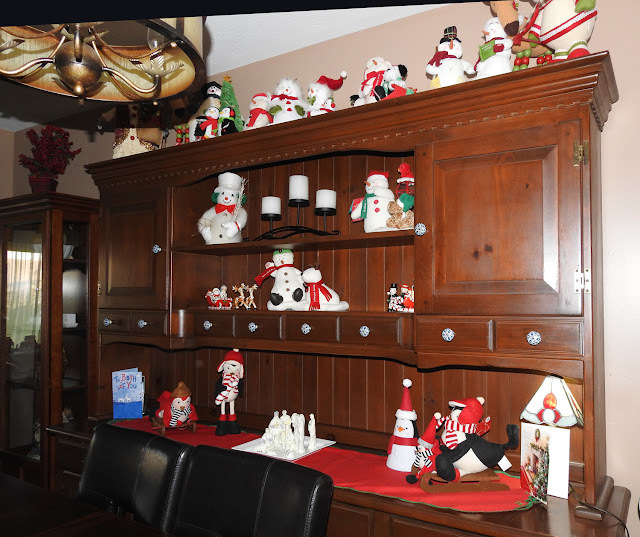 At Christmas, I used to spend weeks decorating the house - pretty much from top to bottom, and back then we had a bigger house than we do today. 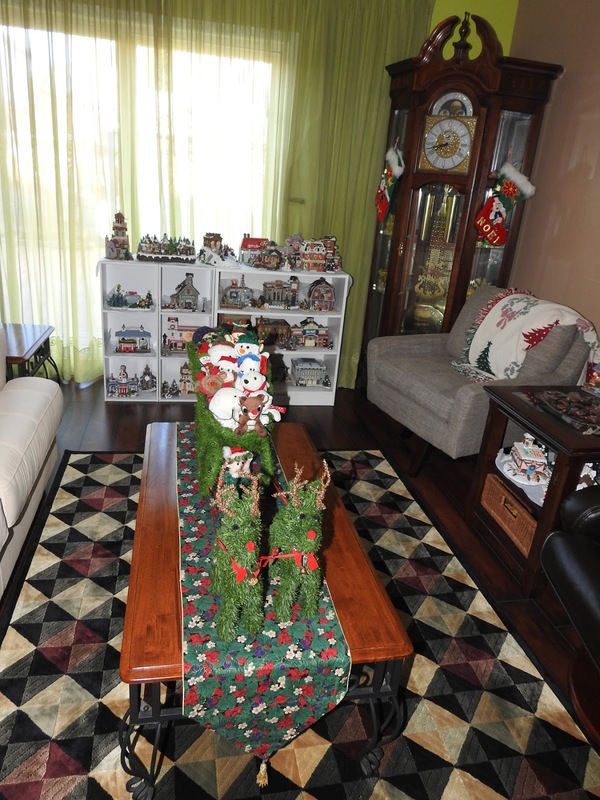 This year, I spent only a few days and didn't decorate beyond the main rooms on the first floor ... the entry, the living/dining room, and the main floor bath. I put a few little things in our main floor guest room (my mother-in-law stays with us at Christmas) and that's about it. I have miles of lighted and decorated garlands I used to do the staircases with (including red gross-grain bows that need steamed and hand-tied every year) and thick garland with large balls that used to be bundled up on top of the dining room cabinet. There's a long string of golden bells that play music, while the lights beat in time with the music; there are stockings and santa caps galore, and still in the storage under the stairs are two Christmas trees (a 6' tall traditional green tree, and a 3' tall tree), several more wreaths and tabletop decor pieces, bathroom towels, kitchen towels, oven mitts and more ... none of which made it out this year. I haven't put up outdoor lights this year either ... one wreath, and a light up Santa is the extent of the outdoor stuff. Partly it's a matter of time, and partly just ... getting older I guess. There's really only so much you want to do as you get older. Enough to make it look "purty" and festive, but not so much that it takes you weeks to put it away after Christmas is over. We don't have weeks to put it all away anymore. We spent late Oct/early Nov. at our place in Florida this year, arriving back home here the last week of November - just in time to put up a few decorations for Christmas. This week coming, I'll start my Christmas baking (pared down a lot from previous years). We plan to head back to our place in Florida in January (but when will depend on some family things) and I want to be all cleared up and packed away before we do go. 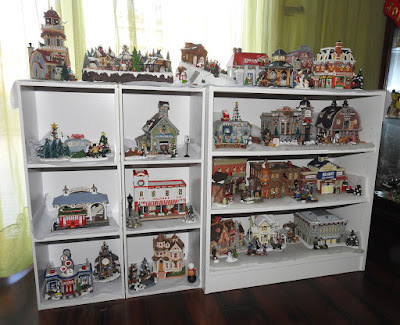 Last year I didn't put out my Christmas village (one of the other things I really love to do at Christmas), so this year I finagled some shelving for it, but it's not the same. It's on display, but usually I like to set it up in a town-like setting, not just stick it on shelves like it is this year. One of the things I'd really like to have someday (and this is not very likely, but still ... 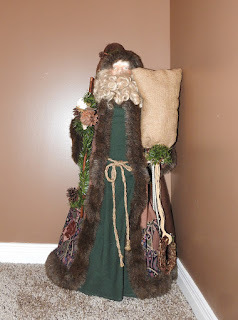 I dream about having it) is a room just for the village so I can leave it set up all the time in the right setting. I'd have room to add a lot more pieces. I try to add one new piece a year and a couple of small accessory pieces, but setting up in this house (love my house, but the space is limited - great for cleaning, not so great for the village) is sort of limiting at the moment. 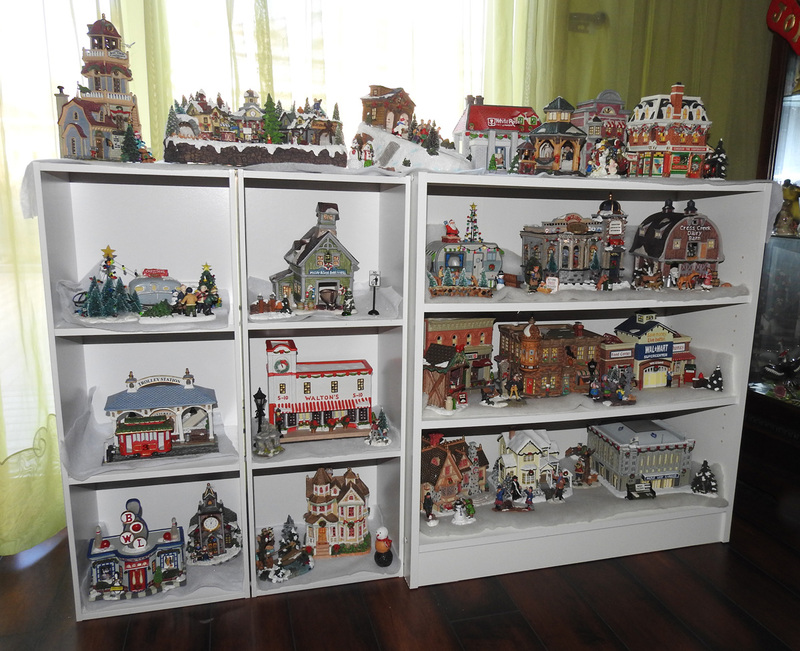 This year I have about 40 main buildings (acquired 3 new ones this year), but only 32 are set up. I didn't have room for them all. Apart from the main buildings are several smaller ones - 3 gazebos (one is out); several bridges (didn't get any of those out); a large background mountain and a couple of small bags of other accessories (roadways, lights, phone booths, etc.) that I just didn't have room for, but rather than lamenting that fact, I'm enjoying just having them up again. 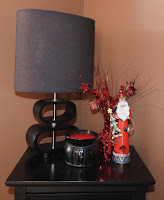 Of the 3 new pieces from this year, only one was bought in a shop (the lighted trailer home bought at Sears - a Lemax product) new. The Main Street State Farm building (second shelf, middle building on the right of the picture) is a Dept. 56 issue, but was (apparently) only sold to State Farm employees, so it's hard to get. I picked that one up by chance (in it's original box) at a church Garage Sale in Florida for $8 (perfectly new condition), and the Walmart/Walton store on the end table we got at Value Village (second hand shop) - no box, but otherwise in new condition too. That one I found really interesting ... If you look at the shelves I have an older "Walton's" store (white with red lettering). I also have a newer "Walmart" store. The one we found this year seems to be the "missing link" between the two I already had. It's funny what you run across when you aren't really looking. 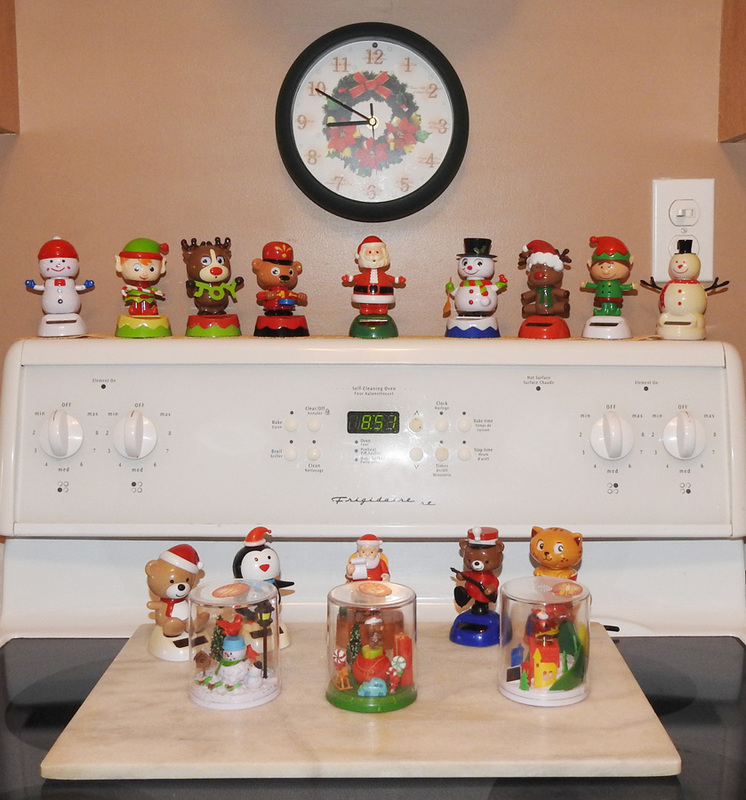 On the dining room cabinet you'll see a series of Hallmark's Snow people collectible issues - they had one a year of those, and all of them require batteries. They sing a Christmas song, and move. I stopped getting those a few years back because they were hard to find in our town - they came out and were gone pretty quickly. 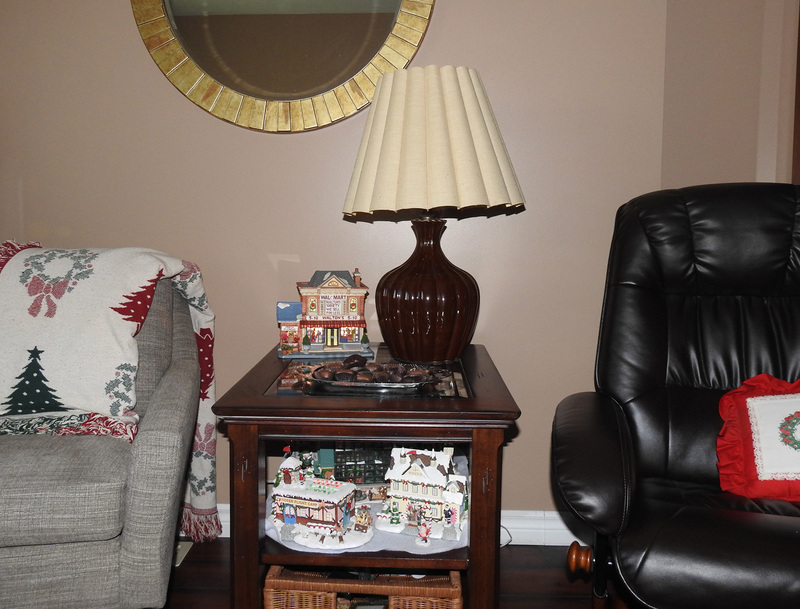 Other critters on the sideboard are penguins and cardinals with a somewhat rustic country look. Those I got from our local Zehr's (grocery store) a few years back, but they no longer carry this type of seasonal thing. 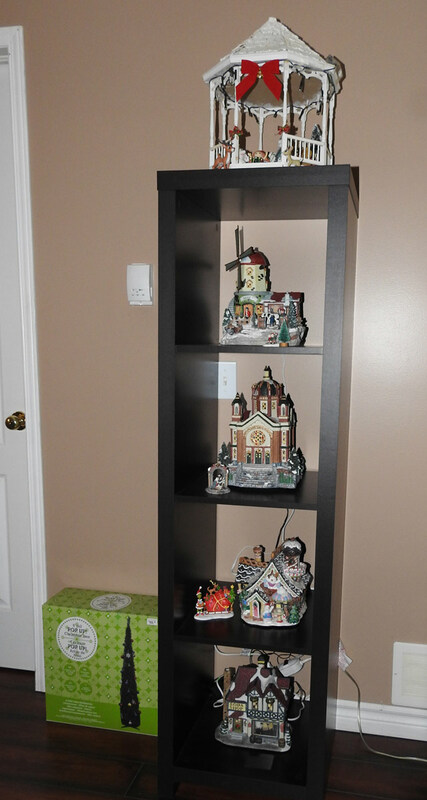 Also on those shelves are a couple of very old china pieces that belonged to my mom. The sleigh with reindeer has a Mr & Mrs Santa salt & pepper shaker sitting in the sleigh, and the sleigh on the right (without reindeer) is full of tiny packages, while standing next to it are a Victorian couple in winter wear. The last thing on this post is probably the very first decorations I had out ... these solar toys are another favourite of mine. The light over the stove keeps them going whenever it's on (which is pretty much all day as there is no window in our kitchen area). Where I find the singing Santa Dog funny and entertaining, I find these moving solar toys cute and calming. There's something about them that makes you stop for just a minute and watch them. Happens to almost everyone who gets as far as our kitchen. Most likely, this will be the last post I have time for this year, so from my family to yours, we're wishing you all a Merry Christmas, and hope to see you again in the new year! And, there one shown in the Home Depot store in the US (haven't seen it in ours yet) that I'd like to add to my collection too.